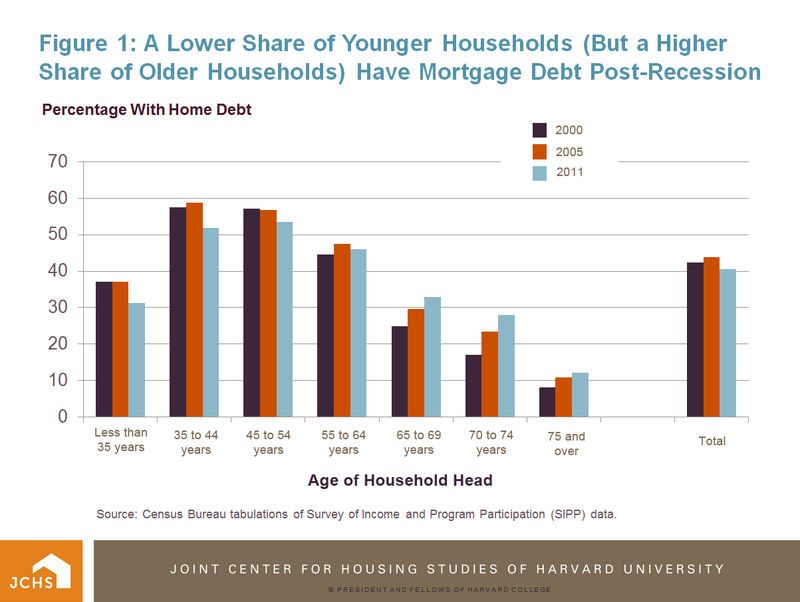 Housing Perspectives (from the Harvard Joint Center for Housing Studies): Why Does Mortgage Debt Continue to Rise Among Older Homeowners? 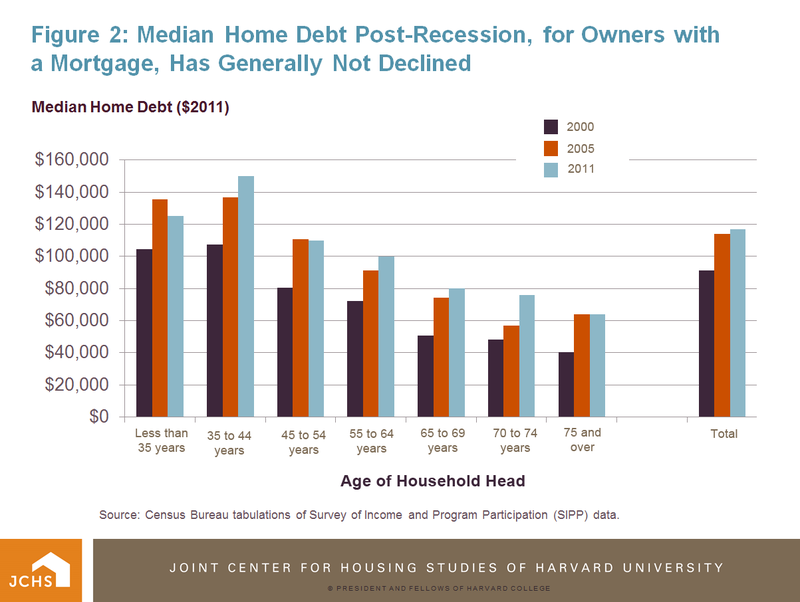 Why Does Mortgage Debt Continue to Rise Among Older Homeowners? A critical limitation of the Fed’s Consumer Credit Panel data is that it includes very limited demographic information (only the age of the borrower). But Bhutta’s findings are supported by a recently released Census Bureau report on the growing wealth inequality in the U.S. that reports on trends in mortgage debt broken down by a wide variety of household demographic characteristics. These data, collected by the Survey of Income and Program Participation (SIPP), clearly show a post-Great Recession decline in the share of young households with home debt (Figure 1) – consistent with a dramatic slowing of movement into first-time homeownership. At the same time, the report also shows that the percentage of older households with home debt has continued to increase. Since 2000, the share of homeowners aged 65-69 with home debt increased by almost 33 percent, and the share of those aged 70-74 increased by almost 65 percent. This trend is consistent with today’s older owners failing to pay down their mortgages as diligently as did earlier generations. Both equity extractions to garner cash to pay for other expenditures, and simple refinancing and extending the payment period to lower monthly payment costs will slow the pace at which homeowners pay off their mortgages. Moreover, among those households with home debt, overall median debt outstanding has continued to increase post-Great Recession, albeit at a diminished pace (Figure 2). 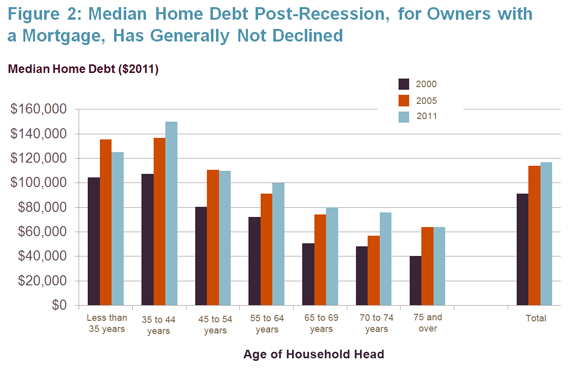 The increase in median home debt is especially true among the elderly. Median outstanding home debt for homeowners aged 65-69 with a mortgage increased by 46 percent between 2000 and 2005, and another 8 percent between 2005 and 2011. 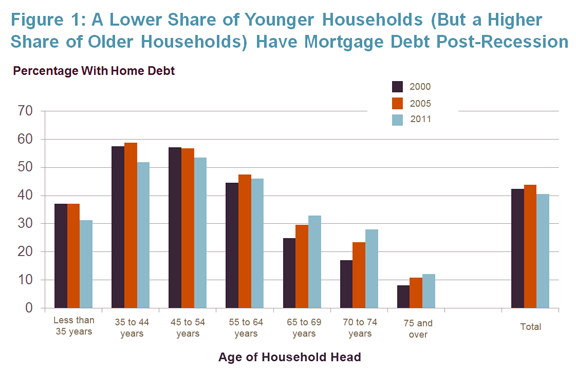 The corresponding figures for 70-74 year old owners with home debt are 18 and 33 percent. This doesn’t necessarily indicate a recent rise in refinancing activity among these older households. Rather it likely is attributable to the aging of 60-64 and 65-69 year olds (with higher mortgage debt from the previous periods) into the 65-69 and 70-74 age groups. Growing mortgage debt among the elderly is troubling. Declining income later in life is inevitable for most households. With mortgage payments a continuing part of the monthly household budget, in addition to real estate taxes and the expense of home repairs, many elderly with high housing cost burdens will need to postpone retirement or spend less on other needs like food or health care. Fewer will be able to draw on wealth accumulated through growth in home equity to help pay the bills late in life. Some will let their homes fall into disrepair or will be forced to sell their homes when they would prefer to age in place. This is a trend worth our continuing attention and concern.